Today we are going to review a web hosting company that you might not have heard of before, Hostinger! With so much choice today it can be hard to choose a proper (shared) web hosting company, and after a lot of research, and having used Hostinger myself I can honestly say that they definitely give you the best bang for your buck so keep on reading. Shared web hosting (the most affordable). Cloud hosting (highly recommended for businesses). VPS hosting (fast while still affordable). Shared web hosting is ideal for people that have only a few low-traffic websites, for example, the starting affiliate marketer that’s on a low budget. Single shared hosting – single as in that you can host max 1 website with 1 email account and a limit of 100 GB of bandwidth. Premium shared hosting – still affordable while you can host an unlimited amount of websites, no bandwidth limit, twice the memory and processing power, and automatic weekly backups. Business shared hosting – highly recommendable for small local businesses, you get the same benefits as you get with the premium shared hosting plan, and to top it off they backup your site on a daily base so that no data ever gets lost, 4 times the memory & processing power for a flawless user experience, and a free SSL certificate of course. The pricing varies, with the single shared hosting starting at only $0,80/month, while the business shared hosting pricing starts at a modest $7,95/month. 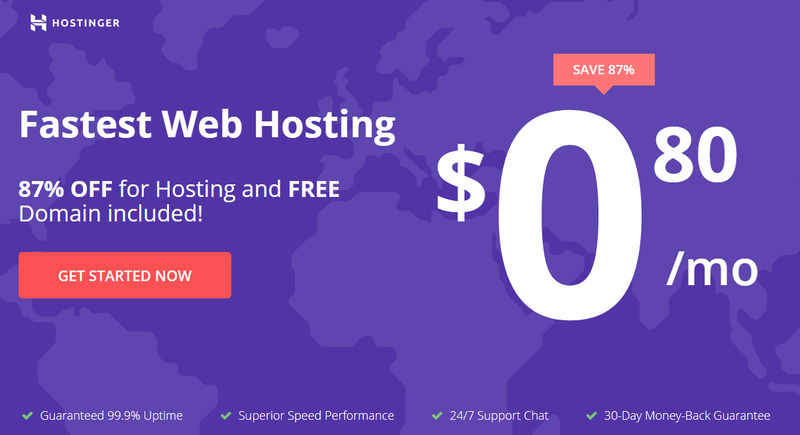 These prices are probably the most competitive that you can find online so if you haven’t found any hosting yet this is definitely one to consider. Cloud hosting is quite a bit more expensive than shared hosting for the simple reason that with shared hosting you are sharing the same server and resources with dozens of other sites. Your data is stored in the cloud which makes it much safer and less sensitive to DDOS attacks, and hacking attempts. Sites hosted on the cloud load much faster than any other type of sites, when you visit a site and you have to wait 3-5 seconds to load you might get agitated quickly. Cloud hosting fixes that problem. Cloud Startup – 40 GB of disk space, 3 GB of RAM and 2 CPU cores. Cloud Professional – 80 GB disk space, 6 GB RAM, 4 CPU cores. Cloud Enterprise – 160 GB disk space, 12 GB RAM, 6 CPU cores. The more cores and RAM the faster your site loads so it really depends on the amount of traffic you receive. If you’re not sure you can always ask someone at Hostinger support, they are online 24/7 without endless waiting ques. The power and reliability of a VPS with the simplicity of shared hosting. I guess that sums it all up! VPS stands for virtual private server, in simple terms that means they divide a regular server into chunks, and you get access to one part of the server. Because you only rent a part of the server it’s much cheaper than renting a complete server for yourself of course. VPS hosting is a little more complicated then shared or cloud hosting, you get root access to the server and have to take it from there. I always find myself spending hours to figure it all out so unless you’re more tech-savvy than I am, and don’t mind spending some time setting it all up it can be a very affordable solution while still benefitting from the massive speed increases that come with it. Hostinger offers six different plans to choose from, with regular RAM ranging from 1-8 MB, Burst RAM from 2-16 GB, CPU speed from 2.4-14.4 GHz, disk space from 20-160 GB, while the bandwidth runs from 1000-6000 GB. Although most companies offer unlimited bandwidth there is always a fair-use policy to prevent slowing down the server for others, as after all at a shared hosting plan you do share your resources. This means that we do not set a limit on the amount of bandwidth, websites or disk space you may use in the normal operation of a personal or small business website, provided it complies with this Agreement. However, in the event your service usage or content presents a risk to the stability, performance or uptime of our servers, data storage, networking or other infrastructure, you may be required to upgrade to a VPS, or we may take action to restrict the resources your website is utilizing. Each web hosting company has similar rules in regards to the term unlimited so this should not come as a surprise, but I do feel this article isn’t complete when leaving that kind of information out of it. I hope you learned something from this Hostinger review, or at the very least are a little bit wiser about the differences between shared hosting, cloud hosting and VPS hosting. I’m an affiliate of many web hosting companies and the reason I decided to write about Hostinger is simply that I think they offer the best hosting money can buy.